Heat registers located next to inside walls or air returns located next to outside walls will tend to make a room less comfortable. Heating systems are oversized for most of the year because they are sized for the coldest day. Forced-air systems use ducts and fans to move air around the house. Inadequate combustion air may create dangerous backdrafting conditions. The required clearance between a B vent on a gas furnace and combustible materials is 1 inch. The three normal combustion products of natural gas are water vapor, carbon dioxide and heat. The Heating I Course provides an introduction to residential heating systems, starting with a description of various fuels. The Course then focuses on the different types of furnaces and boilers. Students will get detailed instructions on operational tests, common failure modes and life expectancies of various systems are covered. Within each section are several Study Sessions to guide you through the material. The Quick Quizzes will help you check your progress. 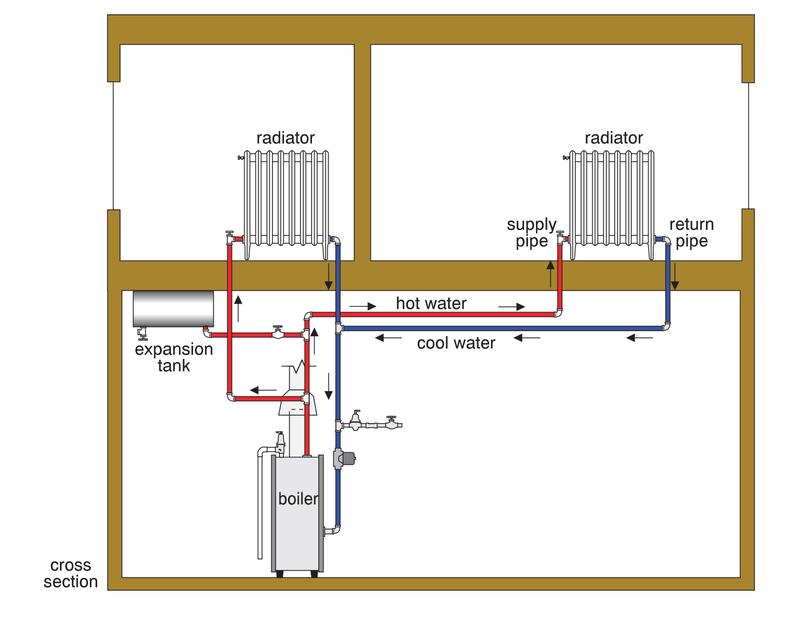 Two-pipe system — direct return — This illustration shows a two-pipe system with pipes going from the boiler throughout the house and is one of the three basic types of piping systems covered in the course. It is from our Heating I Course, Distribution Chapter. All of our 10 Courses contain easy-to-understand illustrations that help you understand the subject.